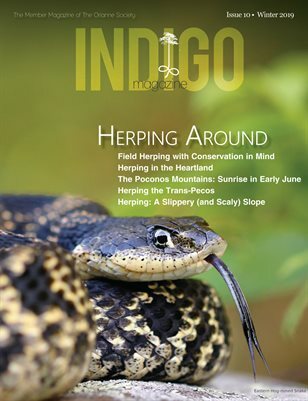 Indigo Days is an annual event that started in 2013 as a way to show our appreciation to our members by inviting them to our Orianne Indigo Snake Preserve in Telfair County, Georgia, to be a part of our Indigo Snake surveys. Indigo Days is always in the winter to correspond with our Indigo field season, and event participants get the chance to search for Eastern Indigo Snakes and Eastern Diamondback Rattlesnakes in the field alongside our staff. Members break up into groups amongst the staff and head out into the field with mirrors in tow to look down Gopher Tortoise burrows, to scour the landscape for blue-black scales, and to listen for the tell-tale rattle of the Eastern Diamondback or the scuttle of a Gopher Tortoise. And though the Indigo Days event was not set up as a team competition, the competition between our staff as to who can produce more animals for their group gets pretty heated, with good-natured ribbing and lightly-barbed zingers (which we have heard is very entertaining). Indigo Days is a two-day event, with participants camping at Horse Creek Wildlife Management Area or Little Ocmulgee State Park. In the evening of the first day, we all meet at the Lodge of the State Park and enjoy some good food, some gentle bickering about who found what, and a few presentations on the natural history of the area and species within it. Indigo Days is a time for our members to get up close and personal with the mission of The Orianne Society, a mission they are part of and support. We enjoy this time with our members and get great satisfaction from showing them what we do on the ground. Indigo Days is announced via email to our members and also on our social media. We usually have to limit sign-up to a certain number of individuals that we can safety take out in the field, and registration fills up fast, so make sure you watch for the announcement and come see what you make happen with your loyal support! Click here to read about Indigo Days 2015. Click here to read about Indigo Days 2014. Click here to read about Indigo Days 2013.